On the 30th of October 1938, the U.S. radio network CBS broadcast an audio drama from the Mercury Theatre on the Air series adapted from English sci-fi writer H. G. Wells’ 1898 novel The War of the Worlds. 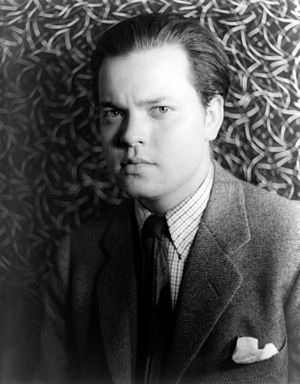 This special Halloween edition was directed and narrated by a 23-year old Orson Welles, future Hollywood filmmaker. The Sunday primetime show took the form of a 60-minute broadcast, most of which consisted of intermittent simulated news bulletins, which could be aired erratically in a musical slot totally uncontrolled by regular adverts, which made the whole experience more realistic. James F. Tracy wrote that, “The opportunity for such an analysis presented itself when CBS broadcast Orson Welles’ rendering of H.G. Wells’ War of the Worlds on on October 30, 1938. Lazarsfeld saw the event as especially noteworthy and immediately asked Stanton for CBS funds to investigate reaction to what at the time was the largest immediate act of mass persuasion in human history. Over the next several months interviews with War of the Worlds listeners were collected, provided to Stanton at CBS, and subsequently analyzed in Cantril’s 1940 study, The Invasion From Mars: A Study in the Psychology of Panic (…) As the US entry into World War Two approached, Rockefeller provided $15,000 to Princeton for establishment of the Office of Public Opinion Research. OPOR was to systematically examine how public opinion is forged, the motivating factors behind mass public sentiment toward certain ends and, in Cantril’s words, ‘following the course of American public opinion during the war that had already started in Europe in which I felt the United States would soon be involved’.” (Early “Psychological Warfare” Research and the Rockefeller Foundation, Global Research, April 29, 2012). Throughout the two world wars, Rockefeller via the C.I.A. funded numerous mass manipulation, attitude change or persuasion studies and behavioral modification programmes. For the most part, American philanthropy was dubiously motivated. You’re the bomb! I never get tired if the frenzied spectacle Welled created. Standing ovation and BOO’s all around. Media is still fueling mass hysteria. Thanks for the post! The power of the Big Lie! Yes “largest IMMEDIATE act of mass persuasion in human history”, though clearly Hitler managed one larger though less ‘immediate’. Now we are all subject to the same exercise as demonstrated in the Russian interference in the US election and by the elected who spouts more Big Lies! That “the Rockefellers used these studies [of the Psychology of Panic] also for their own benefit to suppress mass dissent” is a chilling reminder that this level of mass manipulation has a history stretching back 75 years and must by now have reached a very high level of sophistication.